Goodreads says, "London 1872 - A bloody escape, a deadly threat, a shocking revelation... As an orphan who stole the Queen's ring - only to find the ring was a reservoir that held a truce between the world of Faerie and the British Court - Tiki’s greatest fear suddenly becomes all too real: the fey have returned to London seeking revenge. As war escalates in the Otherworld, Queen Victoria’s youngest son, Prince Leopold, is attacked. In order to protect her family and those she loves, Tiki needs to know the meaning ofan fáinne sí, the birthmark that winds around her wrist. But will she be brave enough to face the truth? The Torn Wing picks up where The Faerie Ring left off. Things in Tiki's world are never calm and she realizes that the fey have returned to London. Rieker and Tiki realize that there's an intense war going on in the Otherworld. Her life as well as the Queen's are at stake. To complicate matters even more, Tiki has a mark on her arm that obviously means something important; she must get to the bottom of the mark and its meaning. Once Tiki does, her world will be changed irrevocably. 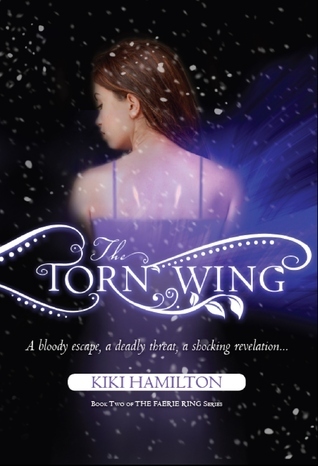 Kiki Hamilton's second book in The Faerie Ring series, The Torn Wing, is an action packed romp through Dickensian London that's the perfect blend of fantasy, historical fiction, and a sweet romance. Did I tell you guys how much I love this time period? Well, I do. Dickens' London is such an interesting time period and the setting is so atmospheric. Hamilton does an excellent job of weaving the magical world with Victorian London. Just as in The Faerie Ring, Hamilton expertly shows us the realities, both good and bad, of the time period to life. However, things are much better for Tiki and her entourage of former homeless orphans in this novel as opposed to their situation in The Faerie Ring. They are shacked up in Rieker's beautiful town home, but Tiki realizes her issues with the fey aren't over. She can't escape them, particularly Larkin, and of course, Tiki has a constant reminder that she's different: her birthmark on her wrist. Rieker and Tiki have such a delightful romance. It's not the type that is overly steamy, but it's sweet and heartwarming. I could easily put this series on my classroom bookshelf and not worry about its appropriateness. The Torn Wing focuses on Tiki's journey of self-discovery. What is the mark on her arm? What are the implications? Tiki truly finds herself in this book and comes to learn some life altering information about herself and her heritage. Book three, The Seven Year King, comes out in May of 2013 and I can't wait to see what is in store for Tiki in the next installment. I'm excited to give this book a try Christina! I was in a reading funk when I read the Faerie Ring so I couldn't quite muster up any enthusiasm for it, so I'm really looking forward to giving this world a second try now that I'm out of said funk:) Such stunning covers on these books too, love them! I think if you pick it up again you'll enjoy it! I hope you get around to it and I agree- awesome covers! Thanks for stopping by, Jenny! Sounds like this was a great sequel! I really need to get this one soon, I adored the first book (fabulous characters + setting = amazing). I agree- I loved the setting and characters, too! I hope you get your hands on a copy. Thanks for visiting, Lea!